Many of our customers indicate to us that they would like assistance with getting our air caster modules underneath the loads and/or machinery they want to move. This is normally not too difficult to accomplish, but in certain circumstances some loads do have very little ground clearance, and not enough to slide our air caster modules underneath. caster modules and other Hovair load moving equipment. All you need is a ground clearance of 1 inch and your problems are instantly solved. raise loads of up to 50 tons up off the floor. With the load suspended by the MatJack, you simply slide under your Hovair air caster modules until they are in the desired position. Deflate the MatJack and do the same for other caster modules that need placing. The MatJack air lifting bags have become so popular with buyers of our standard air caster bearing kits, that we are introducing the Hovair Super Kit which has everything you need and INCLUDES a MatJack air lifting device, too. SAK-22-4-RCK43 – Air Caster Bearing Kit – Weight capacity = 16,000 pounds (7,272 kgs). Four air inlet ports – one for each air caster module. Hose line assemblies with quick disconnect fittings: 2 x 25ft and 2 x 15ft. 1 x 22NSG replacement air bearing. All other fittings and hardware required for your Super Kit to work right out of the box. 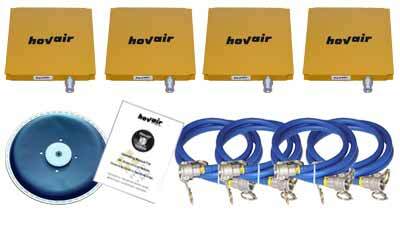 Hovair Systems terrific after sales support – should you ever need it. Big saving over standard items @ $750. over $750 on our normal individual prices of these items.